Dedicated to the preservation, restoration, and interpretation of Beloit's rich history. The Beloit Historical Society, founded in 1910, is the oldest historical society in Rock County, Wisconsin. Headquartered on the west side of town, the society manages two sites - The Lincoln Center and the Hanchett-Bartlett Homestead. The Beloit Historical Society is comprised of five buildings and an area of 30 acres. Programs and events of community interest are held throughout the year at both facilities. Our schedule of events is available at the Lincoln Center or on our UPCOMING EVENTS page. The current location of the Beloit Historical Society is at the Lincoln Center, located in heart of the Beloit Community. 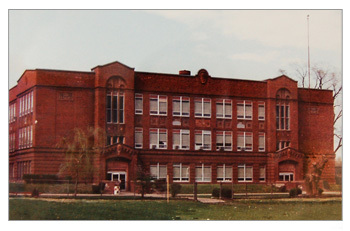 Its location sits upon the space once occupied by Lincoln Junior High School from 1921 to 1985. In 2014, the Society Restated its Articles of Incorporation and revised its By-Laws. They were approved by the membership at the annual meeting; the By-Laws were amended in 2016. Click here to read our Collections Management Policy. Click here to read our Conservation Assessment. Click here to read our Facilities Assessment.